Working in a Division that has sub-disciplines that judge on the ability and the style of the rider. The riders can be judged both over fences and on the flat. In over fences classes the riders are judged not only on their ability to negotiate a course of jumps on their horses, but also on their style and position while they do it. Riders are trying to execute a smooth and consistent round using invisible aids, and trying to make their round seem completely effortless. Their position should remain both accurate and stylish throughout the round. On the flat, riders are tested at the walk, trot and canter at the lower levels, and at more difficult gaits— such as strong or collected walk, trot, and canter, or counter canter and hand gallop— in higher level classes. "Hunter/Jumper" refers to a specific equestrian discipline or style of riding where horses are ridden English style and jump over a series of obstacles, also called fences or jumps. A series of fences is called a "course." 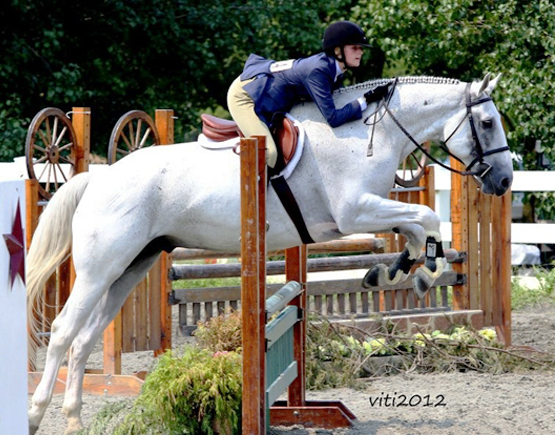 Equitation is a specialty area of the hunter/jumper discipline. Within the discipline there are three distinct sub-disciplines: hunters, jumpers and equitation. The two terms "hunter/jumper" are often used synonymously because hunters show over-simplified courses meant to mimic traditional hunt field obstacles and the judging is subjective. Judges look for horses that are well mannered, athletic and attractive smoothly going over the fences. Jumpers ride over technically difficult courses that tend to twist and turn. The judging is objective and mathematical based on whether the horse knocks down a fence, stops at a fence or does not complete the course in a certain time limit. The horse with the fewest faults and the fastest time taken to complete the course wins the competition. Equitation is a hybrid between hunters and jumpers, where the rider’s abilities are judged subjectively over a more difficult jumper type course. Hunters compete in classes where the horse is judged subjectively by one or more judges. In both jumping and flat classes, each horse is judged on: "Performance and soundness [whether or not the horse appears to be lame]..." (US Equestrian Article 2423). In some classes the horses are judged on more specific features, such as ”conformation, suitability and manners." (US Equestrian Article 2423). Conformation refers to how a horse is put together, i.e. whether he has a desirable and functional physique. Suitability refers to the horse’s natural capabilities for the tasks being asked to perform. For example, a horse which jumps unsafely would not be considered a “suitable” hunter in a hunter over fences class. Manners refers to the horse’s temperament, and how he responds to a rider’s instructions. For example, a horse that kicks out when asked to begin trotting would not have good manners, while another which perks his ears alertly and is obedient will be rewarded for good manners. Hunter divisions at horse shows are divided into numerous categories. Some include "green" hunters for inexperienced horses, conformation hunters where horses are judged on their performance with extra emphasis placed on the horse’s build, working hunters with large fences for experienced horses, and pony hunters for ponies (horses under 14.2 hands tall) only. Other divisions can be divided by the status of the riders who pilot the horses around the course, such as junior hunters for riders 18 and under, amateur-owner hunters for non-professional adult riders or short stirrup hunters for young children just learning to ride. A typical hunter course is 8-10 fences consisting of natural colored jumps, set on straight lines at various points around the ring. Some of the fences are set at related distances and are meant to be ridden as a set with a specific number of strides, or canter steps, in between them.